Not knowing what to expect, Road Warrior TravelingMom headed to Montgomery Alabama for a visit. What did she discover? 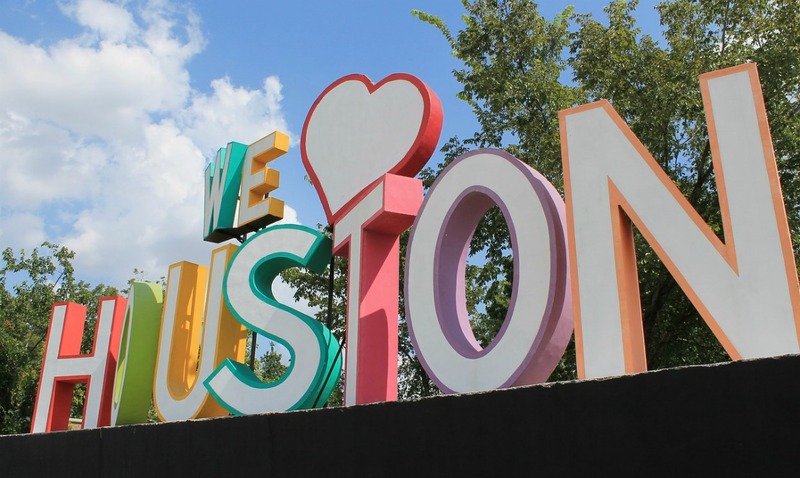 Art, music, breweries, baseball, history, Civil Rights and more. A city in the midst of a major revitalization, there are plenty of fun things to do in Montgomery. Check out these must sees. 1. Take in a family-friendly Minor League Montgomery Biscuits baseball game. 3. Visit a local brewery and hang out with friends. 4. Take in a performance at the Alabama Shakespeare Festival at Blount Cultural Park. 5. Visit the F. Scott and Zelda Fitzgerald Museum. 7. 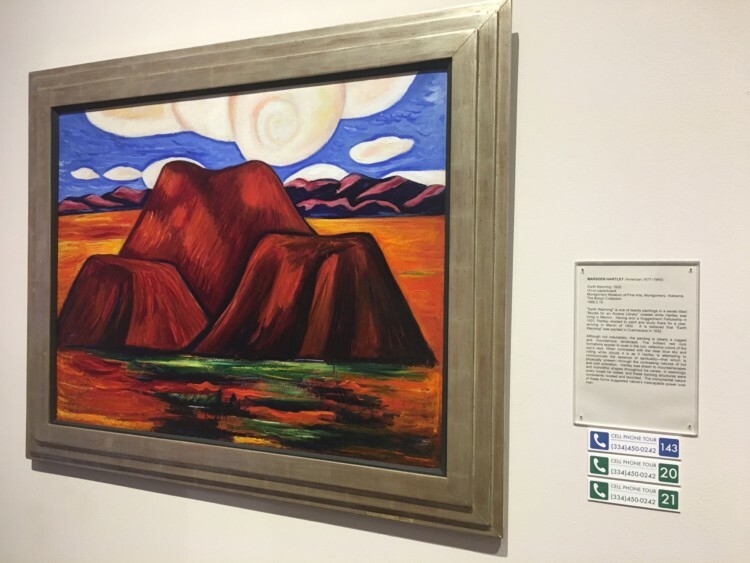 Browse artwork at the Montgomery Museum of Fine Art. 10. 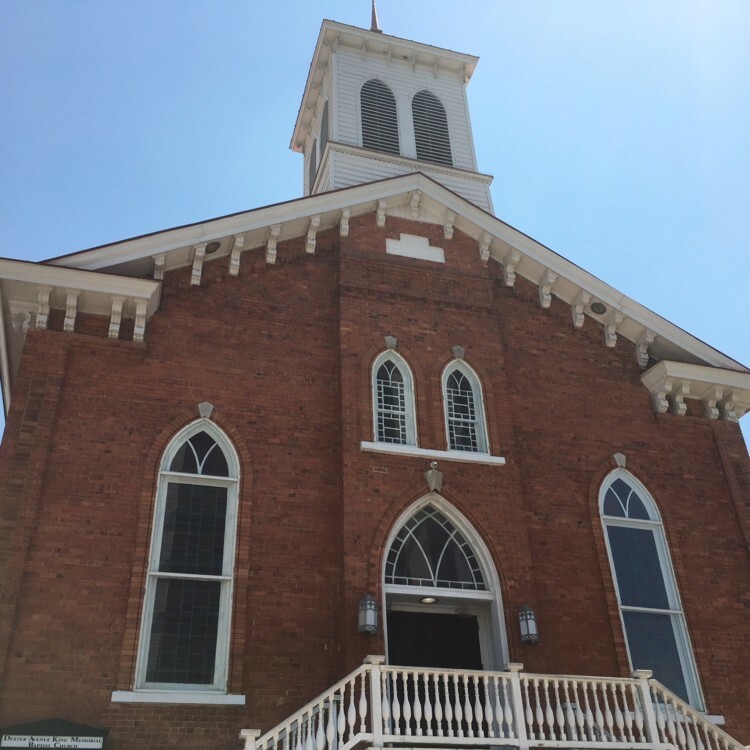 Be inspired at Dexter Avenue King Memorial Baptist Church. Looking for things to do in Montgomery Alabama? 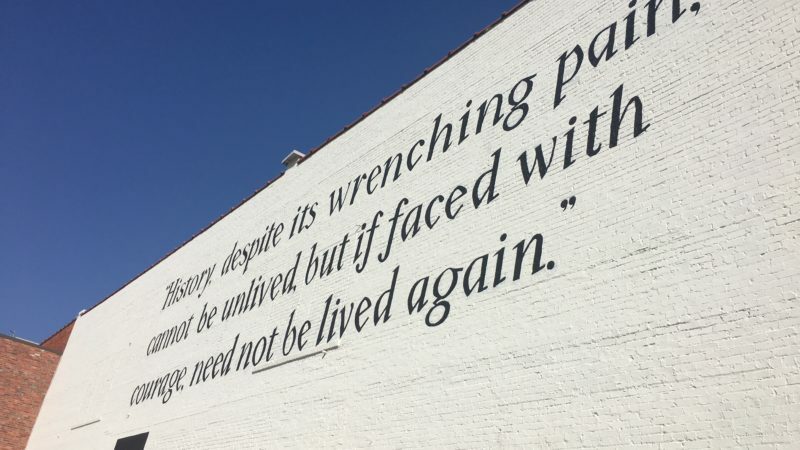 Montgomery is reinventing itself. On our trip, we discovered art, music, breweries, baseball, history and more! Baseball is America’s favorite past time, but most Major League ticket prices are too high for families. Want to foster a love of the sport in your kids? Head to a Minor League Montgomery Biscuits baseball game. This stadium didn’t have a bad seat in it. The lawn seats? $9! Lastly: The mascot is a biscuit! I was impressed with the effort to involve the fans in the game. It made the game truly interactive. Have kids with you? Bring them out past the outfield for a $1 train ride. A night out with friends? Club Car Bar is a beautifully done bar using timbers from the old rail station that the stadium incorporates. 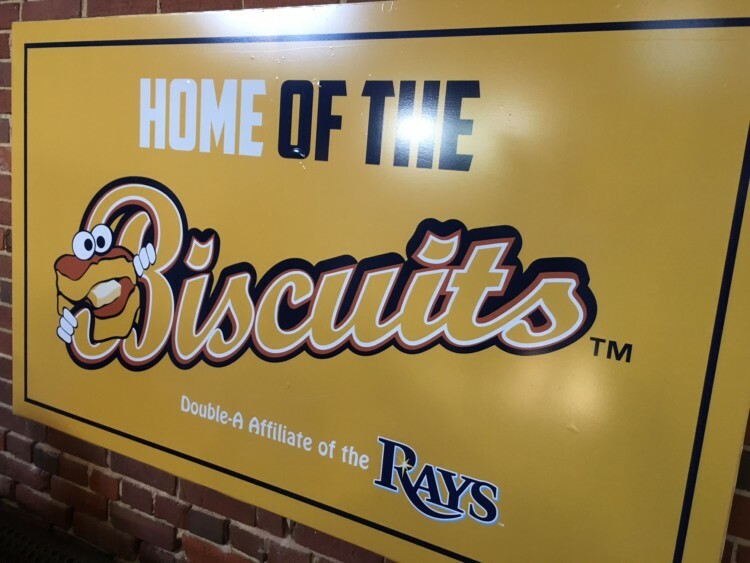 It’s open to Montgomery Biscuits suite holders and Executive Season pass holders at the beginning of the game and opens to everyone at the beginning of the 5th inning. Central (called that because it’s Central to the Alley & center of town) is a gorgeous space. The developer owners took an old warehouse and turned it into one of the hottest restaurants in town. Central’s ingredients are sourced locally. Everything we tried was a flavor party in our mouth. Chef Jason McGarry (whom we have to love because he started his career at a Huddle House, y’all!) has added a mix of traditional (pimiento cheese anyone?) and innovative dishes (jerk octopus!) to the menu. Now you know you’ll eat good food here but the drinks are standouts as well. Next time we’ll try even more! 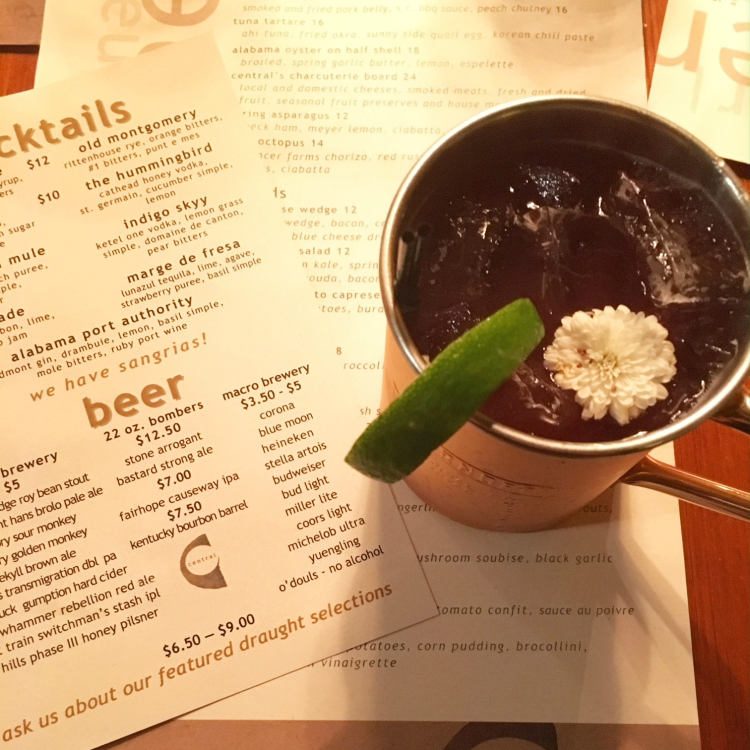 The Blueberry Tea containing house-made blueberry balsamic vodka, hibiscus simple syrup, ginger beer and lime was the perfect refreshment for a hot day. Not to be cliché here, but this newly opened taproom and brewery is the place where everyone knows your name. You’ll walk in and contemplate moving to Montgomery so that it can be your local hangout. Bonus: It’s family friendly with games for the kids and a patio for pooches. Babies–fur or otherwise–are welcome. Besides the atmosphere, this spot has a truly fun story. Brewer Andrew McNally is a Clemson grad with a chemistry background. With a pharmaceutical job that kept him away from home, he had a revelation. “I was traveling around the country and realizing what breweries do for their communities. It made me want to bring that to Montgomery,” Andrew says. McNally and friend Tim Doles opened Common Bond brewery in April of 2018 and are already a hit. 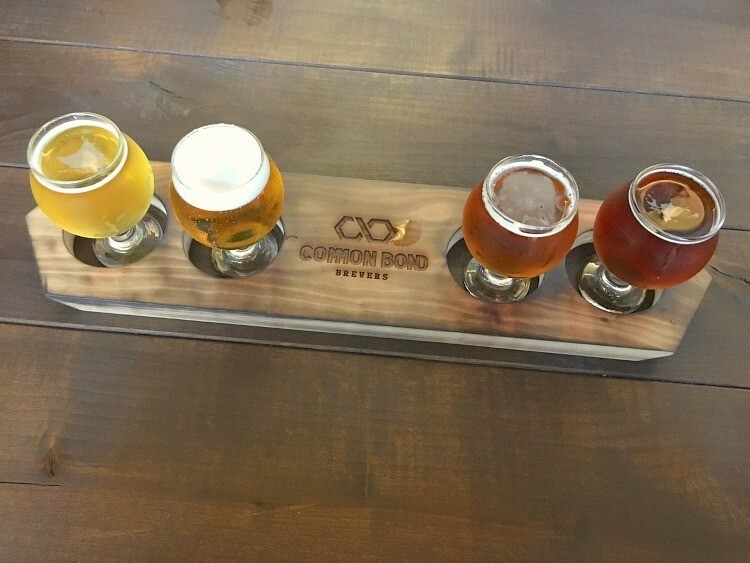 Having grown up in Delaware with the influence of Dogfish Head and friends at Blackstone in Nashville, Common Bond’s brews are mostly on the lighter side. One to absolutely try? The unique rye amber called Rambler. Located on the grounds of the 293-acre Blount Cultural Park, the Alabama Shakespeare Festival is one of the largest Shakespeare Festivals in the world and the largest professional theater in Alabama. Performances span multiple genres, from Shakespeare to more recent cultural favorites. Civil rights shows coming in 2019 will tie into the Equal Justice Initiative’s new museum. While touring the theater, we were able to see how much organizers value attention to detail. For example, in the garden stage area, they only used plants native to England during Shakespeare’s lifetime! 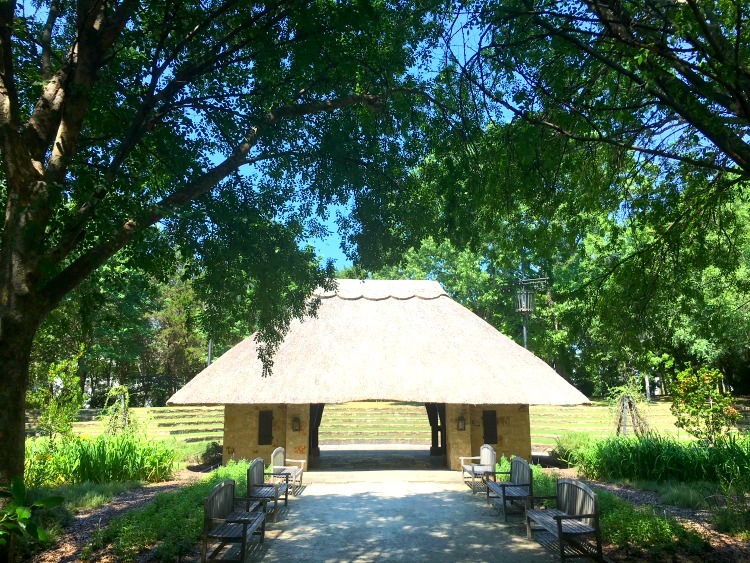 The thatching detail on the roof acts as a “signature” of the craftsman. Even if you don’t take in a show, take the time to walk the grounds at Blount Cultural Park. 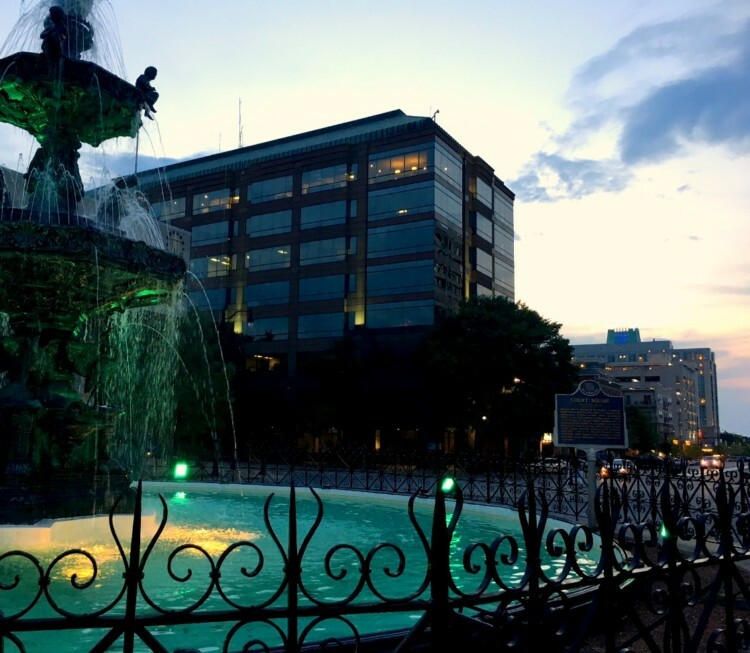 With ponds, statues and walking trails, it’s a great way to spend some time outside in beautiful Montgomery. Bonus: It’s free to walk the grounds. Read More: Free Things to Do in Montgomery. 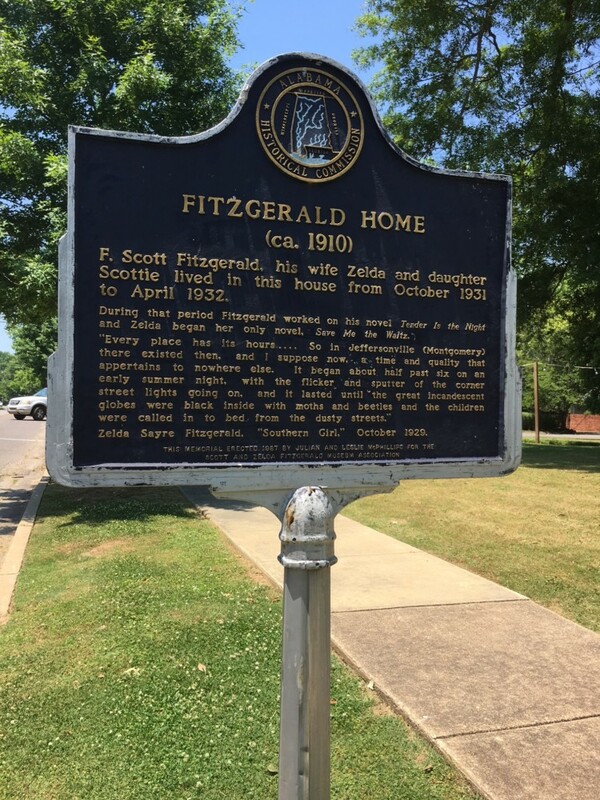 In Montgomery, you can see the house that F. Scott Fitzgerald and Zelda Fitzgerald, a Montgomery native, lived in for one year in the 1930s. Zelda Fitzgerald wrote her only published novel, Save Me the Waltz, in this house and her dust jacket photos were taken on site. Celebrating the 100th anniversary of Zelda Fitzgerald and F. Scott’s meeting in 2018, the museum opened the upstairs apartment as a rental on Airbnb. It isn’t anything fancy (there are plans to remodel) but book a stay here to see if any good writing vibes rub off on you. Writers interested in a short term residency can contact the museum for more info. The location is perfect for those looking to immerse themselves in the heart of Montgomery. Admission: Suggested donation of $10. Hours: Tuesday- Sunday 10a-3p. Originally, the Kress was a department store that carried everything. In modern times, this historic building is a mixed use blend of apartments, offices and retail. The Kress on Dexter also houses an art gallery and coffee shop. A “pocket park” next to the building provides green space. Located downtown, the Kress building is an easy item to add to your things to do in Montgomery list and is within walking distance of Common Bond brewery, Central, the Legacy Museum and the Montgomery Biscuits’ stadium. The Kress building embraces its history. During construction, the workers stumbled upon signage identifying water fountains as White and Colored. Those signs have been used in the new space to call attention to the history of the area. Located in Blount Cultural Park near the Alabama Shakespeare Festival, admission to this museum is free. Let me say that again: it’s free. Add this must-do to your things to do in Montgomery list. As a visitor to many museums, this one stood out. The kids’ area is expansive and includes multiple interactive activities. The weaving together of art concepts on a child’s level was masterful. The Montgomery Museum of Fine Art is just one of the great free things to do in Montgomery. 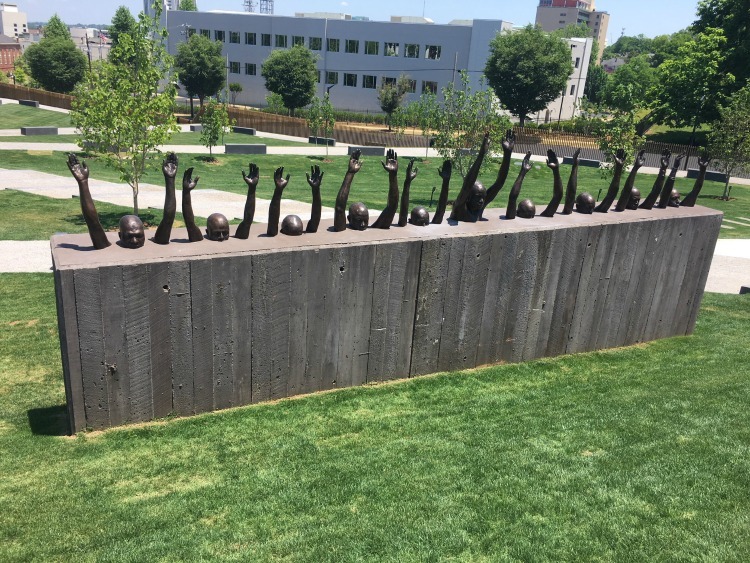 Open since April 2018, this museum run by the Equal Justice Initiative (EJI) is a mind-blowing experience. Even that description doesn’t do it justice. It traces racial inequalities from the beginning of slavery in the United States up through the present, including the epidemic of mass incarceration. Consequently, this museum is intense. Many images and stories in the exhibits will be disturbing for young children and even adults. The fact that this is real life and a part of our history makes it even more sickening. As a result, the experience was moving. I did an initial visit solo. Later I brought my very mature 8 year old. Tickets are $8 adults, $5 students and seniors, under 6 are free. We highly recommend the combination ticket which allows entry to the Legacy Museum and the National Memorial: $10 for adults, $5 students and seniors, under 6 are free. Read More: Tips for bringing kids to visit the Legacy Museum. The National Memorial for Peace and Justice exists in conjunction with The Legacy Museum. You will walk through grounds that have sculptures. 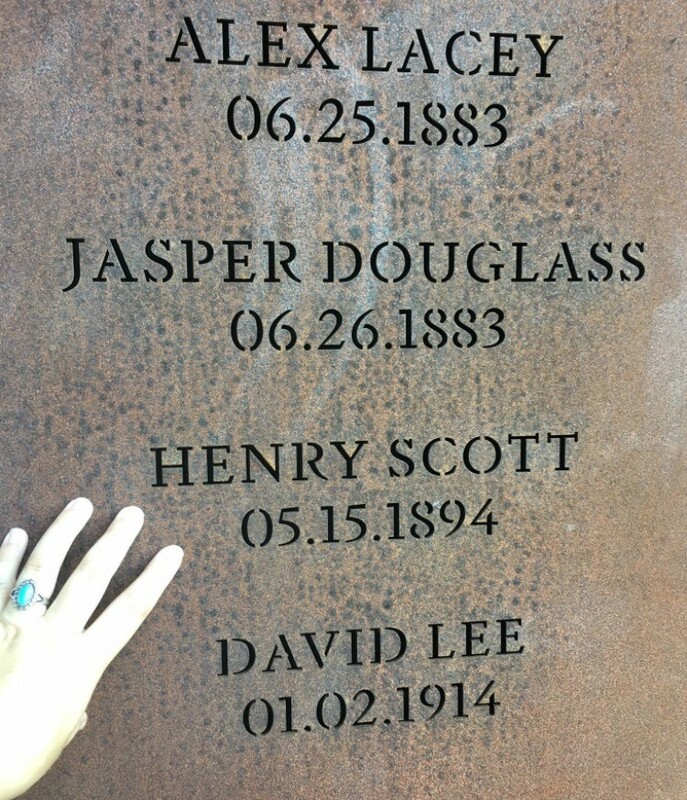 In addition to the sculptures there are 800 hanging six foot monuments naming victims of racial lynching incidents. Each monument represents a United States county. Seeing how many people have been violently killed due to racial violence near your home is a sobering experience. This space has the ability to change the landscape of the South. Counties can apply for a monument to display in their county. 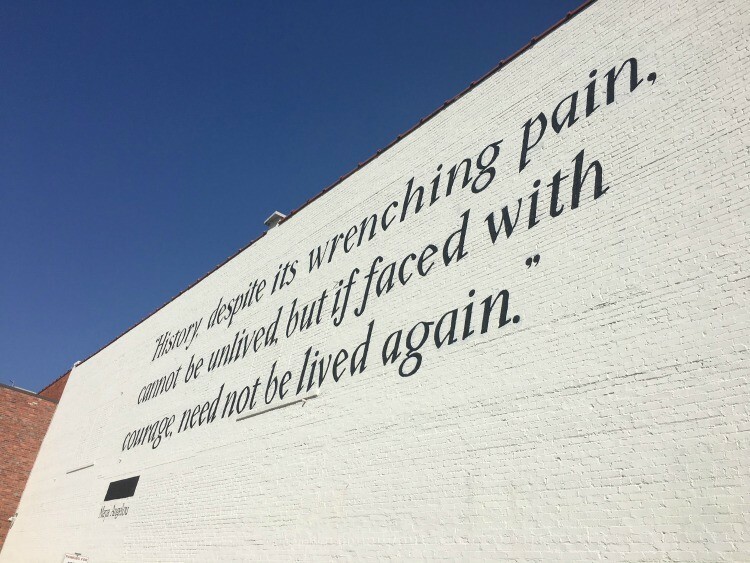 If the Equal Justice Initiative succeeds in placing these monuments in the counties where the lynchings happened, it has the power to change the dialogue and visibility for future generations. Tickets are $8 adults, $5 students and seniors, under 6 are free. We highly recommend the combination ticket that allows entry to the Legacy Museum and the National Memorial: $10 for adults, $5 students and seniors, under 6 are free. Touring the Church was inspiring, uplifting and informative. You can’t comment on a visit to Montgomery without talking about Ms. Wanda. She makes the experience an intensely personal one. I spent the second visit tending to my daughter. Between the emotional topic and her shyness, she spent much of the visit alternatively hiding behind me and wiping away tears. However, she insisted on staying. At the end of each tour, Ms. Wanda has everyone hold hands in a circle for a quick prayer. Afterwards, she chatted with my daughter about how sometimes in life we may not be at our best or happiest but we have to dig deep to find what makes us happy. It was a very adult conversation handled in a graceful way. To this day, my daughter brings up how important it is to share your light with the world. While visiting the church you’ll see a short video. Next you’ll see Dr. King’s office, have the opportunity to stand at his lectern, view a special mural and go into the church. Make it a priority on your things to do in Montgomery list. You will not be sorry. Tickets are $7.50 for ages 12 and above and $5.50 for children ages 4-11. You can book a tour by filling out the reservation form on their website. Tours are available on the hour Tuesday -Friday from 10am-3pm and on the hour Saturdays from 10am-1pm. 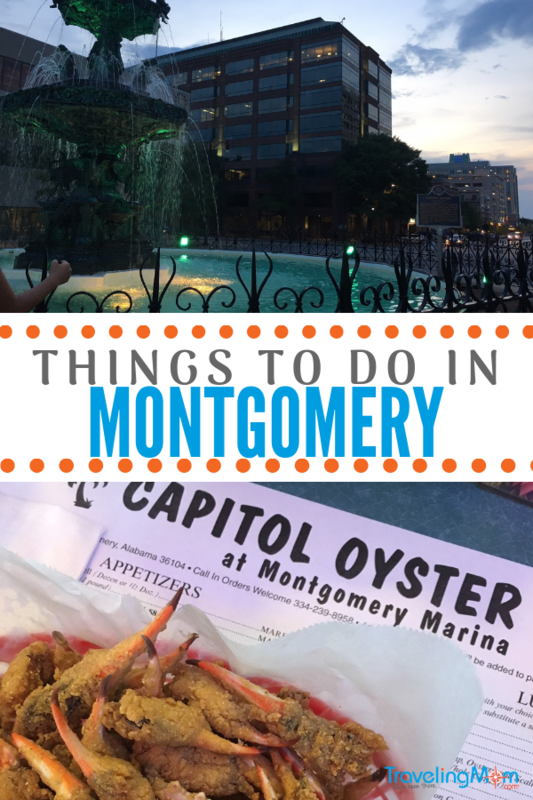 What are your favorite things to do in Montgomery?